With just under four weeks to go until the 2016 presidential election, here's the state of the race from the viewpoint of 14 forecasters. You can find all the associated maps, as well as a few others, on our 2016 Presidential Election Forecasts page. Since our last update on October 5th, Hillary Clinton's average total electoral votes climbed from 280 to 300, most of which derived from forecasters moving states out of toss-up. Donald Trump's average only fell slightly, from 193 to 189. Note that the statistical projections (shaded in gray) may change several times a day as new input data (e.g., polls released that day) are processed by the models. This will lead to more variability vs. the other forecasters. A fascinating new poll out in Utah has Hillary Clinton and Donald Trump tied, with independent conservative Evan McMullin close behind, within the margin of error. Gary Johnson also makes a significant showing, with the non-major party candidates combining for a total well in excess of either Clinton or Trump. This sets the stage for a possible win by a third party in Utah this year, if Utahns can settle on either McMullin or Johnson. 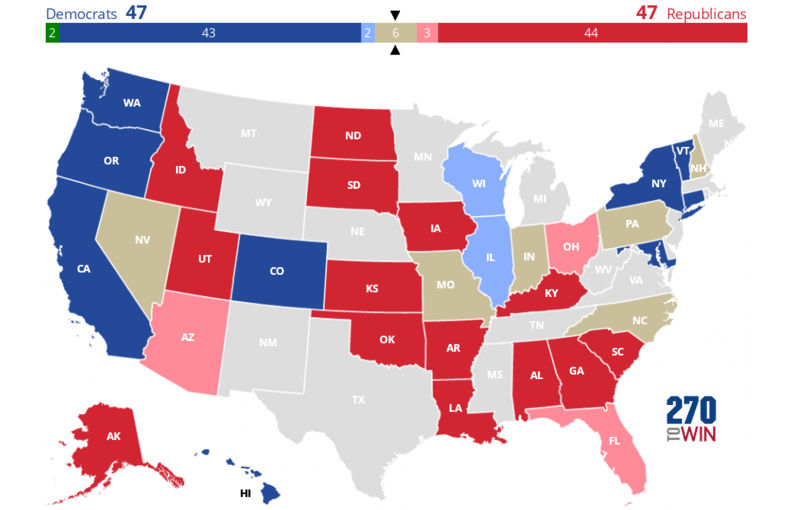 Our three-way electoral map allows you to consider the possibility that a 3rd party could win electoral votes in 2016. Specific names can be set by clicking to the left of the electoral counter. We've given Utah to McMullin in the example below. Donald Trump rebounded in the portion of an NBC News / Wall Street Journal poll conducted entirely after Sunday's second presidential debate. However, he continues to trail Hillary Clinton by a fairly significant margin. Trump trailed by 11 (four-way) to 14 (head-head) in the widely-publicized portion of the poll conducted after the release of the tape and before the debate. For those polled after the debate, Clinton's lead was 7. For the full poll, taken October 8th through 10th, Clinton's lead is 9 (four-way) to 10 (head-head) points. The partial poll release has been removed from our database. Below, we compare the results to the last full NBC/WSJ poll from September 21. Both head-head and where 3rd parties were included, Clinton's lead grew by 3 points overall. However, the post-debate margin of 7 points is roughly the same as the full mid-September poll, so maybe we are right back to where we were a few weeks ago. That said, a 7 point lead nationally is significant - about the same margin as Barack Obama defeated John McCain in 2008. 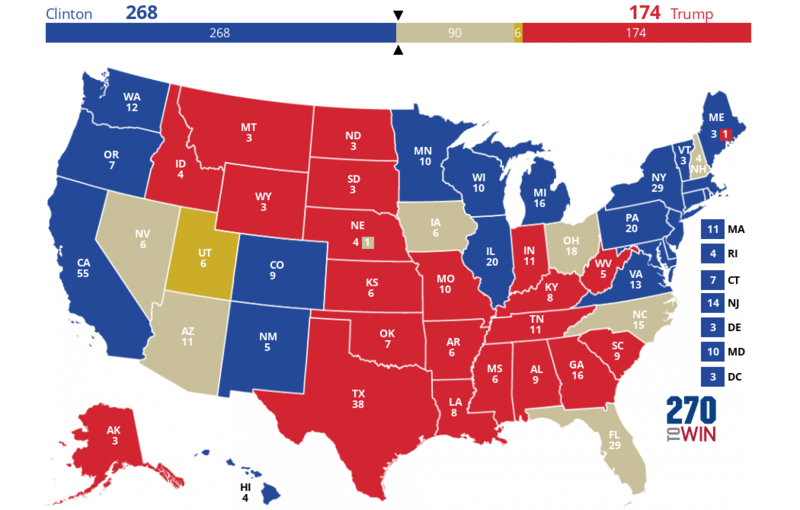 In that election, Obama received 365 electoral votes, well above the 270 needed to win. The two Pennsylvania polls are most notable. Hillary Clinton has now opened up a nine point average lead over Donald Trump in this critical battleground. That state has moved to lean Clinton in the electoral map based on polls. That map currently has Clinton with 260 electoral votes, Trump 161. A very busy week for poll releases has been mostly favorable for Hillary Clinton, with the Democratic nominee taking a larger lead in battleground states such as Michigan, Pennsylvania and Florida. Including the lastest figures, Clinton now is ahead by more than five points in states representing 240 electoral votes. While still close overall, perhaps the biggest shift this past week has come in Ohio. Trump was consistently ahead by about 4-5 points in most pre-debate polling; while several polls this week have shown Clinton with a small lead. She now leads by one point on average. This gives her 340 electoral votes in the 'no toss-ups' version of the polling map, where any lead is shown as red or blue. Another key milestone in the presidential race is this Sunday's 2nd debate. A strong performance by Trump could change the narrative and reverse Clinton's recent bounce. Absent that, particularly with early voting underway in many places, time may be running short on the Republican nominee's efforts to find 270 votes on the electoral map. With just under five weeks to go until the 2016 presidential election, here's the state of the race from the viewpoint of 14 forecasters. You can find all the associated maps, as well as a few others, on our 2016 Presidential Election Forecasts page. The various projections have converged in recent weeks, as forecasters are likely giving more weight to polls (vs. earlier in the cycle).